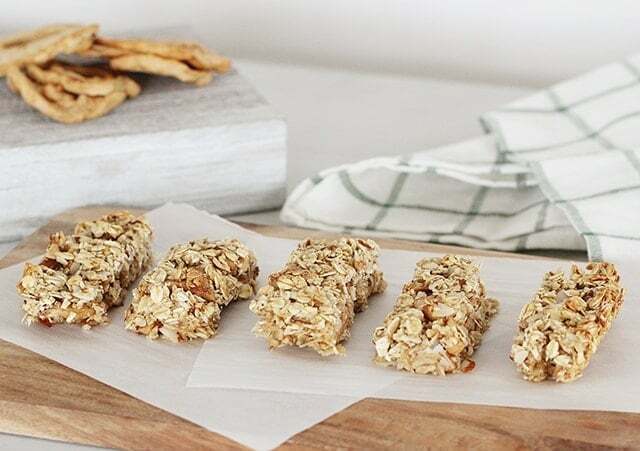 Use oatmeal to make amazing Oatmeal and Apple Granola Bars, and help your kids get the benefits of fiber and extra nutrients! According to The World’s Healthiest Foods, oats are the most nutrient-rich out of all the grains. That’s great because they are so versatile too. So why oats? Excellent source of manganese, good source of fiber and vitamin B, high in protein, helps lower cholesterol, stabilizes mood by maintaining blood sugar, and they are available year round. Has fiber! Kids ages 3-10 need 8-15 grams of fiber per day. Oatmeal has 3 grams per half a cup. Enhances immunity (keeping those kids healthy this winter). Lowers risk for high cholesterol, high blood pressure, and even type 2 diabetes. How can we get our kids to eat more oats? Hot oatmeal- I’ve met kids who love hot oatmeal for breakfast, and some who hate it. It’s definitely a texture thing. You can help kids learn to love it by starting them eating this hot food for breakfast or adding different flavors that they do like, to improve the taste. Cold Oatmeal- Overnight oats is oatmeal that you add liquid to and set in the fridge overnight. This has a different texture than regular hot oatmeal and some kids prefer it. Try our caramel apple overnight oats, or banana bread overnight oats. 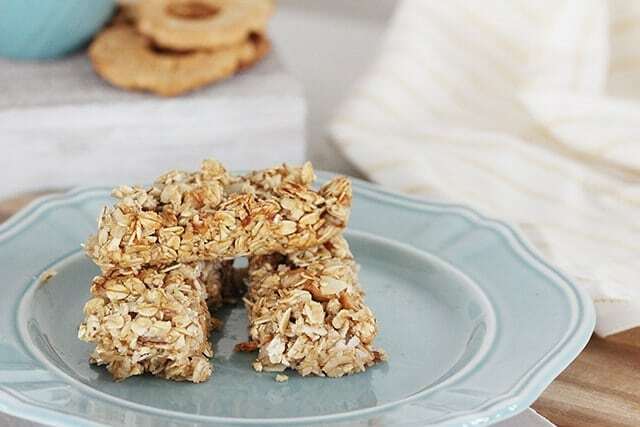 Oatmeal cookies- There are healthy recipes for oatmeal cookies, and they really can be a good way to introduce your kids to the taste of oatmeal. Try our Soft and Chewy Iced Oatmeal Cookies. Granola – one snack and breakfast we always have on hand is homemade granola. We eat it with fruit, yogurt, or even in trail mix. Try our sugar free granola here, or 5 ingredient granola here. 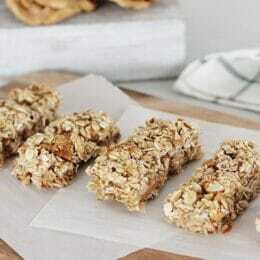 Granola bars- Today’s recipe is an easy way to get your kids to eat oats!! These granola bars are easy and yummy! We also have these grab and go granola bars! Added to baked goods like breads, cakes, muffins- you can incorporate oats into any of your baked goods to replace some of the flour. It will increase the fiber and nutrients of whatever you are making. Used to thicken ground meats or stews- Like flour, thickening sauces is possible with oats! Ground into oat flour as a replacement for other flours- grind up oats and you have oat flour! It’s a great addition or replacement for wheat flour. So, see how you can get your kids to eat more oats today! Preheat oven to 300 degrees F. Spread oats onto a baking sheet and bake for 10-15 minutes, until slightly golden brown. Watch closely to avoid burning. Spray an 8×8 baking dish with cooking spray and set aside. Increase oven heat to 350 degrees F.
Allow oats to cool for 10 minutes and then mix with chopped apples, almonds, sugar, honey, and salt. Mix well. In a small bowl, whisk together the egg whites and vanilla. Pour into oat mixture and mix until blended and coated evenly. Scoop mixture into prepared baking dish and cook for 15 minutes or until golden brown. Cut into 6-8 bars, depending on the desired size. One of my recent favorites-Oatmeal Waffles! http://allrecipes.com/Recipe/Oatmeal-Waffles/Detail.aspx I use whole wheat flour and decrease fats by using 3 TBS oil and 1/3 cup applesauce. 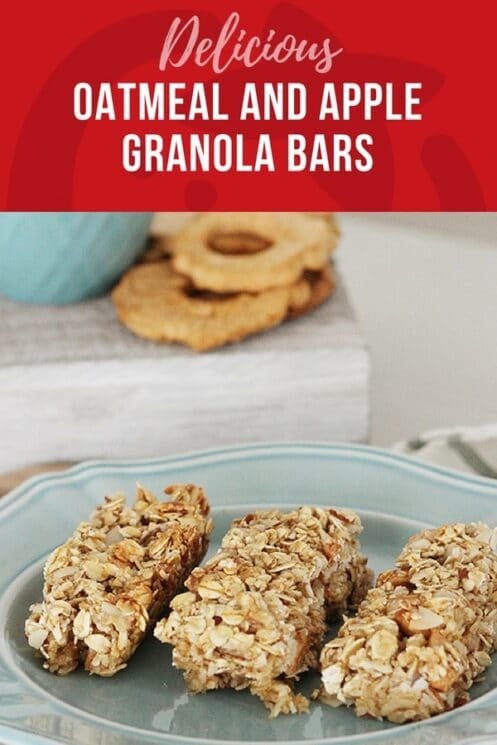 Do you have any experience making these granola bars without the egg whites? My son is allergic to dairy and eggs. Thanks! Can you recommend a substitute for the almonds? I’m highly allergic to all nuts. Can I just omit them completely, but then I noticed that it’s 1/2 cup.? Can the 1/2 cup sugar be eliminated. To cut sugar grams.